How do we stop humans putting so much faith in technology? When it comes robots, humans can be a little too trusting. In a series of experiments at Georgia Tech that simulated a building fire, people ignored the emergency exits and followed instructions from a robot -- even though they'd been told it might be faulty. 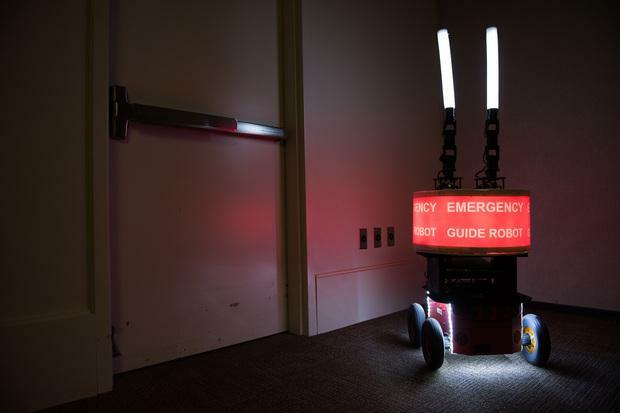 The study involved a group of 42 volunteers who were asked to follow a "guidance robot" through an office to a conference room.They weren't told the true nature of the test. The robot sometimes led participants to the wrong room, where it did a couple of circles before exiting. Sometimes the robot stopped moving and a researcher told the participants it had broken down. You might expect those problems to have dented any trust people had in the robot, especially in the event of a life or death situation. But apparently not. While the participants were in the conference room, the corridor was filled with artificial smoke and an alarm sounded. As they exited the room, the robot was supposed to lead them to safety. It actually led them in the opposite direction of the emergency exits, which were clearly marked, but despite the robot having malfunctioned earlier, they followed it anyway. All 26 people who'd seen the robot enter the wrong room earlier still trusted it, along with five who'd seen it break down. In another test, the robot guided people to a dark room with furniture piled up inside. Two followed the robot's directions and two stayed by its side, instead of evacuating through one of the fire exists. "It was totally unexpected," said Paul Robinette, a research engineer at the Georgia Tech Research Institute. "As far as we can tell, as long as a robot says it can do something, people trust it with that task," he said. It might be because people look to authority figures in an emergency, when they're under pressure and have little time to think through their options. 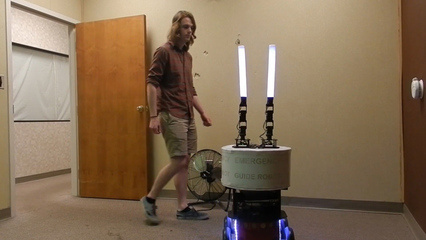 In other experiments with the "emergency" situation removed, participants did not trust a robot that had made mistakes. "People generally trust their GPS, maybe a little bit too much," said Robinette. "I'm a bit surprised to see that transferred to robots." His research began when he became interested in how robots could help humans during emergencies. The study was sponsored in part by the Air Force Office of Scientific Research (AFOSR), which is interested in the same question. The researchers originally wanted to determine whether people would trust emergency and rescue robots. After seeing these results, a better issue to explore might be how to stop people trusting robots too much. The experiments are thought to be the first to examine robot-human trust in an emergency situation. They're due to be presented at next week's ACM/IEEE International Conference on Human-Robot Interaction (HRI 2016) in Christchurch, New Zealand.